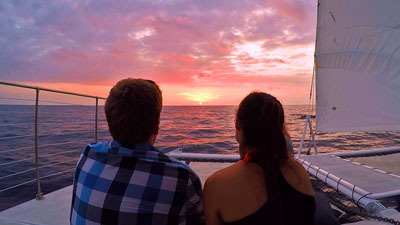 Nothing beats the tranquility of a Kona sunset cruise, watching the sun set while sailing along the Kona coast. Relax with a balmy breeze filling the sails, a friendly group around you, and a drink in hand for a smooth voyage aboard our comfortable sailing catamaran. Our sunset cruise departs from Kailua Kona on the Big Island of Hawaii, about 30 minutes south of the Waikoloa Beach Resort area. The evening sunset sail begins when you step aboard Kolea, our spacious 36-foot (11-m) catamaran, at Honokohau Harbor in Kailua-Kona. Cast off in the hours before sunset and settle in for some great appetizers and pleasant conversation. You can take the helm, help raise and trim the sails, or just stretch out and relax as you cruise along the coast. Along the way, you can take spectacular photos of the Kona shoreline, the mountains, and the changing colors of the sky. 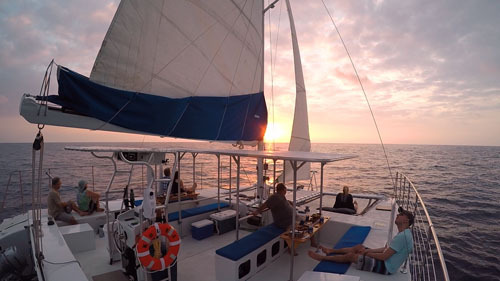 Hang out in the trampoline seating suspended just above the water at the boat’s fore and enjoy some good times with great company as the sun drops below the horizon and the sailing vessel Kolea carries you back to port. Fresh fruit, light appetizers, tropical juice & bottled water are provided. Guest are also welcome to bring additional food or their own alcohol if desired. (must be at least 21 years old with a valid photo ID) Trip length 2 hours. Regular price $99 per adult & $69 for children between the ages of 5 and 12. Have our beautiful sailing catamaran to yourself and sail along the Kona coast on your own private catamaran charter. Fresh fruit, light appetizers, tropical juice & bottled water are provided. Guest are also welcome to bring additional food or their own alcohol if desired. (must be at least 21 years old with a valid photo ID) Trip length 2 hours.